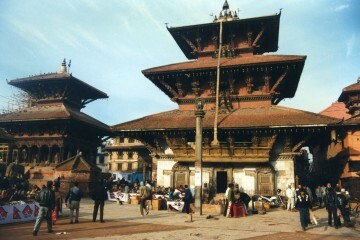 There are many reasons people choose to visit the Everest region of Nepal. 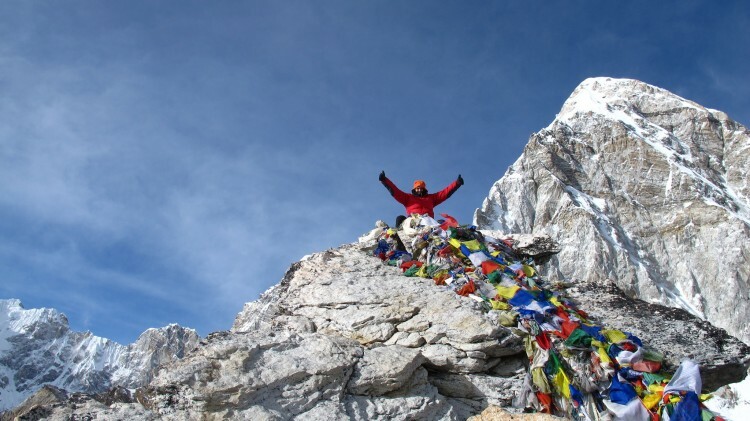 The Everest Three High Passes Trek is one of the classic treks there. Many trekkers make it their mission to cross the infamous ‘high passes’ in addition to reaching Everest Base Camp. 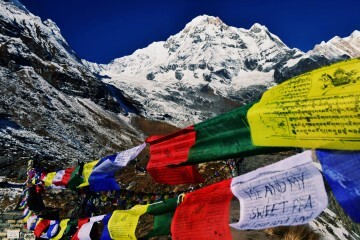 Stunning and unparalleled mountain views, including the giants of Everest, Ama Dablam and Lhotse, can be seen. 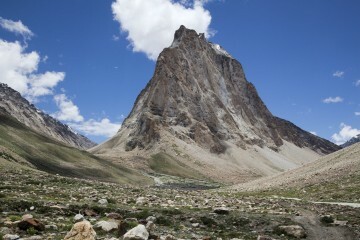 The passes are challenging, and offer an opportunity to acclimatise before reaching Base Camp and Kalapathar. 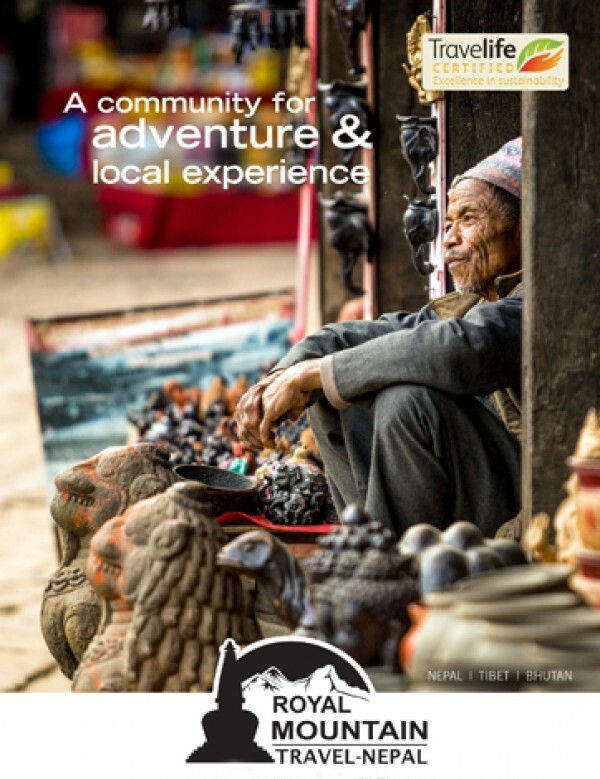 Culture is found in abundance and trekkers are sure to enjoy Sherpa hospitality and potato pancakes, as well as a landscape dotted with Buddhist stupas and colourful prayer-flags. The region enjoys a unique balance between remoteness and comfort. There are no roads in the area (unlike the Annapurna or Mustang regions), yet the accessible trails traversed regularly by porters and yaks ensure that even in the higher regions, you can still get eggs for breakfast every morning and hot showers on demand. 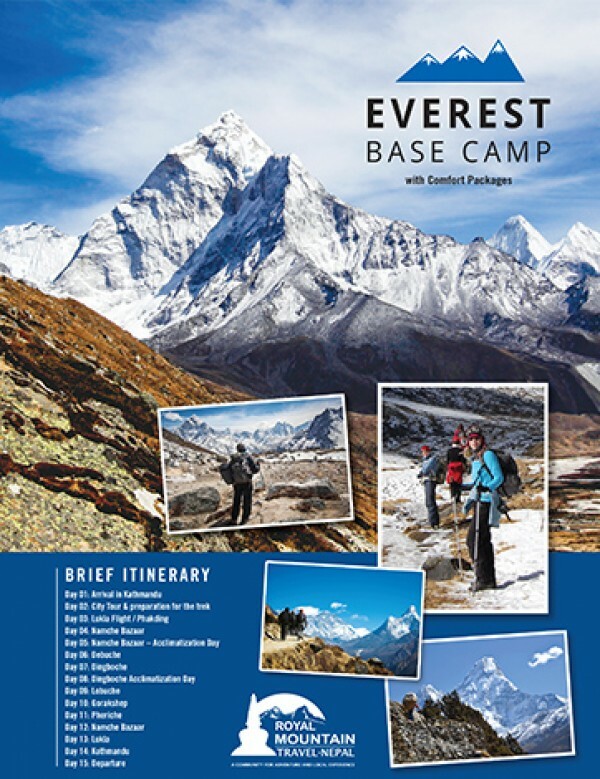 The Everest Three High Passes trek is both challenging yet possible. 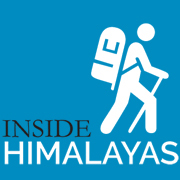 There is no shortage of information about why the trek is one of the most popular treks in the Himalaya. However, I’m going to explain why you should buck the trend and consider doing the Three High Passes Trek ‘backwards’. 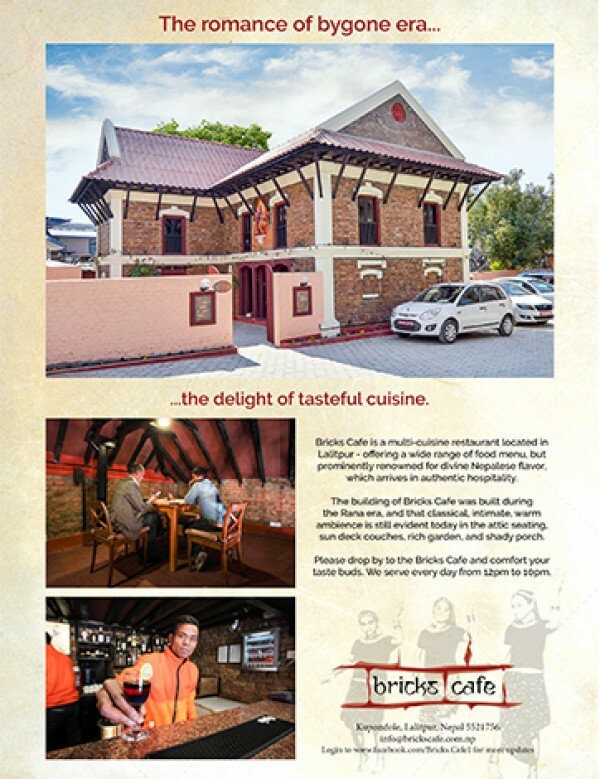 The classic itinerary, the one you read about in most guidebooks, is anti-clockwise. Why? Touted as a ‘challenging trek’, it is thought to be somewhat easier to cross the passes anti-clockwise, as ascents tend to be slightly less steep that way around. Additionally, old habits die hard: there is now such a tradition of traversing anti-clockwise that few people seem to give much thought to completing it clockwise. When researching my itinerary I had also assumed that it must just be preferable to complete it clockwise. But some dedicated investigation both of literature and on the ground revealed the many merits of completing the circuit clockwise. 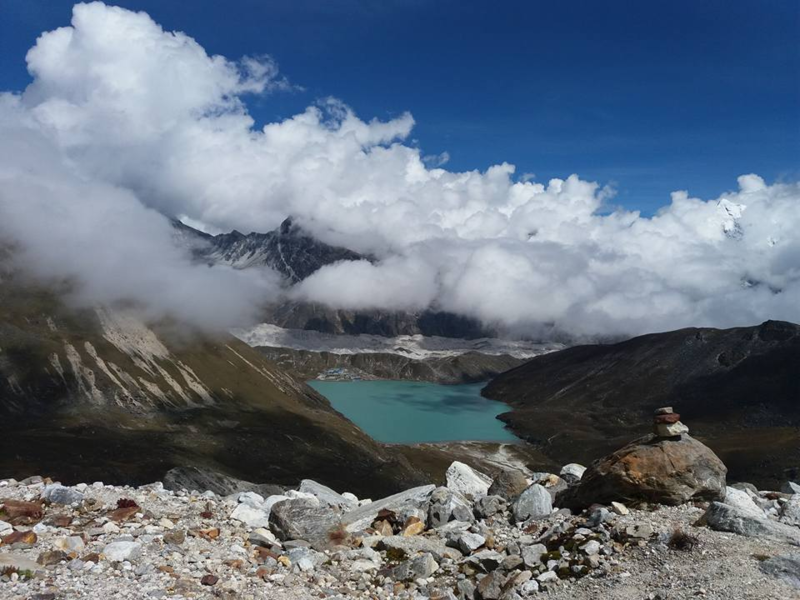 View of Gokyo Lake from the top of Renjo La Pass. Photo by Hannah Straw. For most, the highlight of this trip is Everest Base Camp. 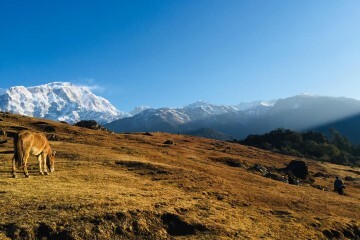 Completing the Three High Passes Trek in a clockwise direction will mean that by the time you reach Gorakshep, the hopping-off point for Base Camp, you will have crossed two out of the three high passes. 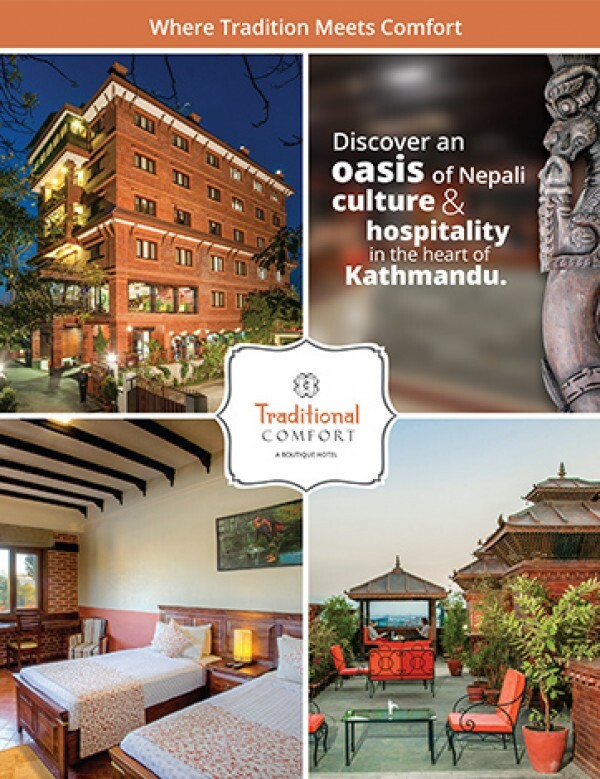 Therefore, you will be better acclimatised and more likely able to enjoy the stunning views at Kalapathar and Everest Base Camp. 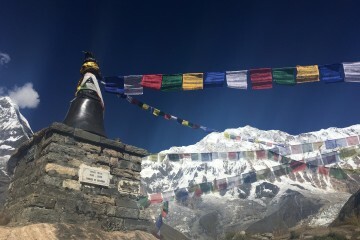 Additionally, if the ‘goal’ of your trek is Everest Base Camp, it can be difficult to muster the energy and enthusiasm to tackle two challenging 5000-plus-metre passes after you have achieved your main objective. Completing the trek in the clockwise direction means that each pass you accomplish puts you closer to your goal, both geographically and physically, as your blood thickens with oxygenated cells. The early-morning get up required to see the first shafts of light tickle Everest is much easier if you’re better acclimatised. 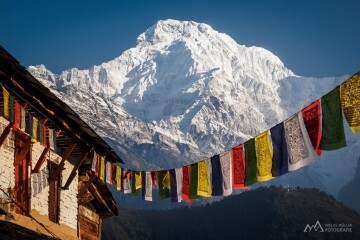 Another consideration is the alternative perspective the clockwise trek gives to the classic Everest-region views. For instance, the classic anti-clockwise route would have you climbing Renjo La with the glistening Gokyo Lake behind you, and then a perfectly decent but hardly spectacular view down the valley to Lumde once you’re over the pass. 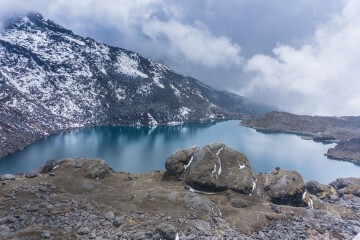 Turning the trek around, however, means you are rewarded with views of the main lake at Gokyo from the top of Renjo La. You can enjoy the descent all the way to your resting point in the village of Gokyo, as the lake’s sparkling waters appear to widen as you get ever closer. As your first ‘high pass’ of the trek, this is a really unbeatable view, and a perfect reward for a challenging yet accessible climb from Lumde. From Gokyo, take a stroll to the nearby Scoundrel’s Viewpoint for fantastic views of Everest, minus the crowds of Kalapathar. 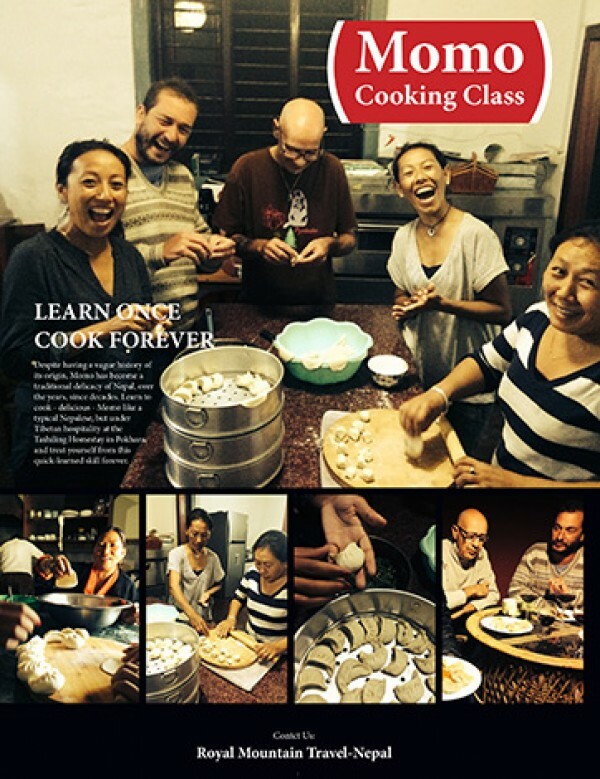 It’s a very worthwhile activity for filling a ‘rest day’ in Gokyo village. 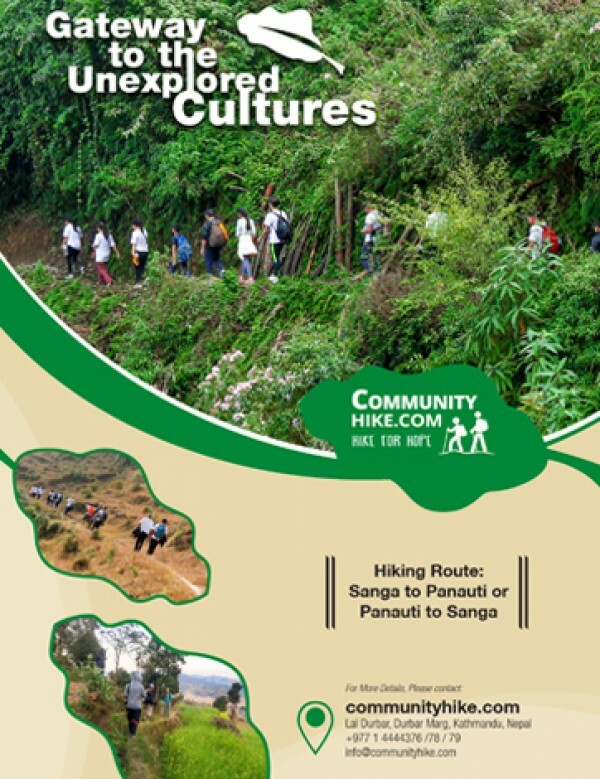 There is an important practical reason for doing the Three Passes Trek in a clockwise direction. The movement of the glacier near Lobuche has dismantled parts of the path to and from the Kongma La, and tracks that appear on GPS or paper maps can become outdated very quickly. Anti-clockwise trekkers will find themselves crossing the glacier late in the afternoon, after a tiring day of ascending and descending Kongma La from Chukkung. Crossing the glacier in dwindling light and being unsure where the path actually leads can increase the risk and difficulty of the section. We heard about a group requiring rescue near midnight during our trek. A clockwise trek, however, will have you crossing the glacier directly out of Lobuche early in the morning, when you are fresh and have daylight to spare for the best visibility. You could also see if any guides in Lobuche are available for a few hours in the morning to help you find your way over the glacier. 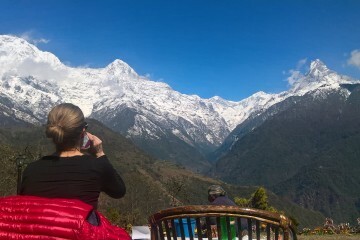 View of Everest from Scoundrel’s Viewpoint, near Gokyo village. Photo by Hannah Straw. Trekking clockwise and starting early, you should reach the top of Kongma La Pass by late morning. From the top, you will be greeted by majestic views of Ama Dablam, which will accompany you all the way to your resting point of Chukkung village. Taking the pass in the usual anti-clockwise direction, starting from Chukkung, would put these glorious views behind you. Don’t forget to climb Chukkung Ri early morning after sleeping in Chukkung, for views that are almost as good as Kalapathar! Many people skip the accessible visit to Ama Dablam Base Camp in their rush to reach the more famous Everest Base Camp. 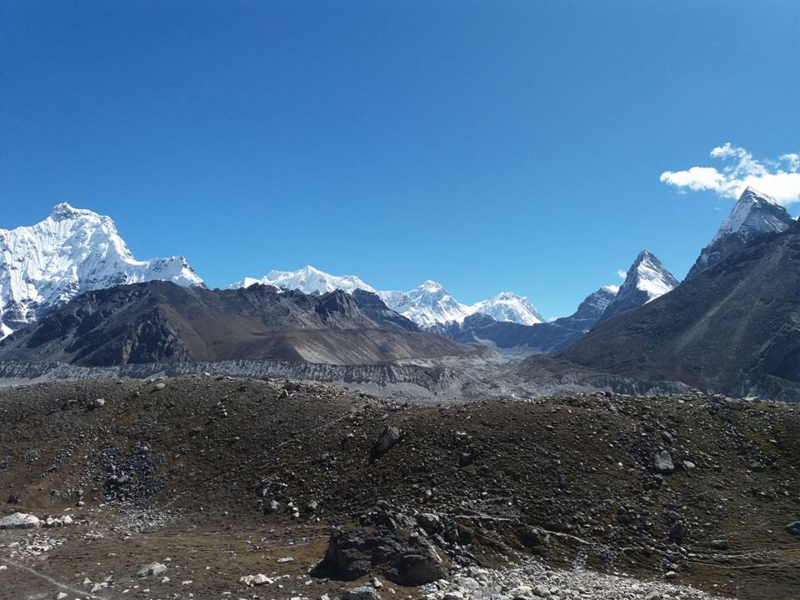 Following the clockwise route, you could consider adding Ama Dablam Base Camp as a side trip to your itinerary on your way out of the region, when you are more relaxed for time. It can be achieved in a morning from Pangboche: leave your bags at the lodge and return for lunch before continuing to Tengboche. Ama Dablam Base Camp as part of a clockwise High Passes Trek is your final ‘big visit’ and a lovely way to say goodbye to the Himalaya. The final argument for the clockwise route is that you can beat the crowds from this direction, or at least, meet them head-on. 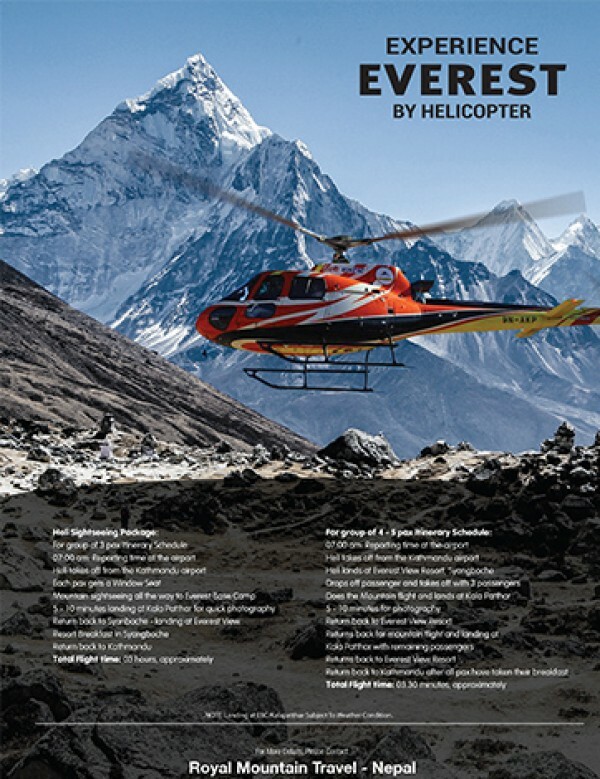 The Everest region can get very busy during peak tourist seasons, and it can be frustrating to end up stuck behind a large tour group, trying to find space to overtake. Taking the High Passes route in a clockwise direction means you tend to encounter these large groups head-on, which makes passing them much easier. Also, by taking the route clockwise, you may often end up at your sleeping location before the main crowds arrive from the other direction, giving you a greater choice of lodges. A clockwise version of the Three Passes Tre is better completed by those who are already reasonably acclimatised, otherwise the crossing of Renjo La (your first pass on the clockwise route) can be rather challenging. 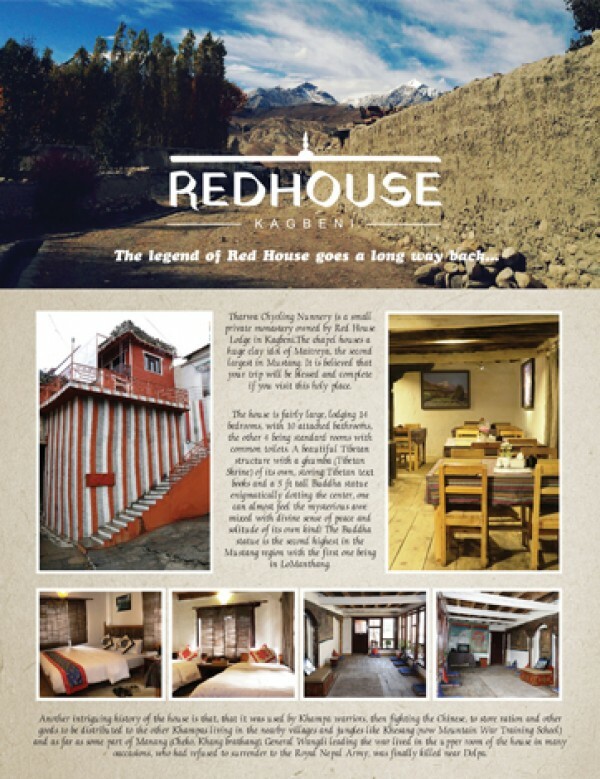 Alternatively, you can build into your itinerary a rest day in Namche Bazar, from which some excellent side trails with views of Everest could be explored. You could also break your walk to Lumde by overnighting at a lodge en route. 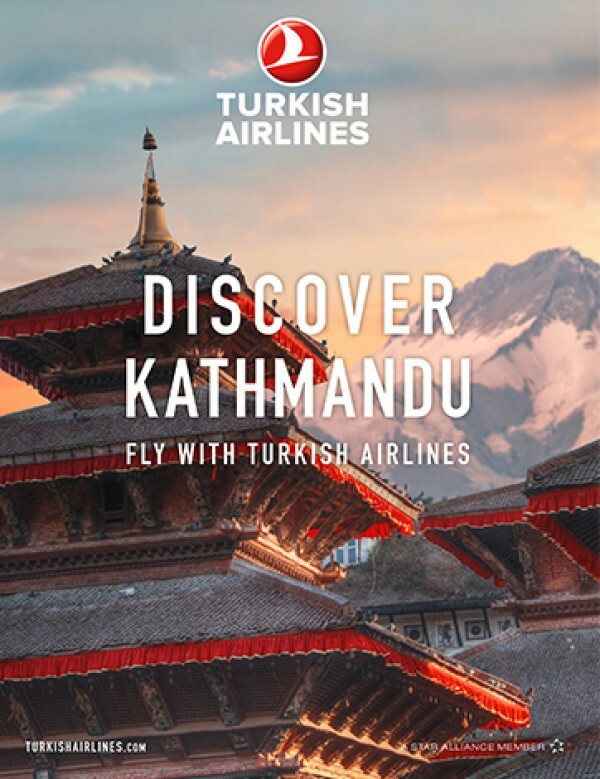 In Nepal, temples and stupas are usually circumambulated in a clockwise direction, so you can think of your clockwise trek as a ‘kora’, or a pilgrimage of this fascinating and beautiful region. its amazing, i would go and feel the same as you are feeling. Its my dream to go once in whole life. Thanks for sharing good informative post.